We’d love your help. Let us know what’s wrong with this preview of Thanksgiving by Mary R. Arno. Playing girl detectives, Peg and Emmaline hitchhike to the Winn-Dixie, where Emmaline hopes to find her runaway sister. Harry, Emmaline's brother, lurks on the edges of their toxic, disjointed fam New Orleans, Summer 1965: Nancy Drew, the Beatles, Hurricane Betsy. For four young people, it is a time for sailing lessons, clandestine cigarettes, facts of life, guilty secrets. Playing girl detectives, Peg and Emmaline hitchhike to the Winn-Dixie, where Emmaline hopes to find her runaway sister. Harry, Emmaline's brother, lurks on the edges of their toxic, disjointed family. Meanwhile, Mimi catches the measles at her family's summer cottage. Sent home with the family's housekeeper, she gets a taste for grown-up adventure and a glimpse of the compromises and deceit that come with it. To ask other readers questions about Thanksgiving, please sign up. Thanks to Netgalley for an advanced reader copy in exchange for an honest review. This was a short novel set in New Orleans from the mid-60s to the present day. Three women experience tragedy and hope together with a southern flavor and wonderful details of one of my favorite cities. The writing deserves 5 stars. What's there is thorough and compelling. The problem I had was that there just wasn't enough there. Chapters jumped characters and time periods with abandon leaving me with a bunch of sna Thanks to Netgalley for an advanced reader copy in exchange for an honest review. An amazing book by Mary Arno. Huge fan of all things New Orleans but this went above and beyond, with the quirky characters you'd expect and the grit and humanity you don't often get. The author is so deft with her writer's paintbrush; she can paint a character with a single line, a scene with few words but loaded with meaning. The characters are intricate, as is the story. And the ending, well, I won't spoil it for you... Suffice to say nothing's predictable and the story will stay with you! Mary Arno's Thanksgiving is set against the backdrop of the city of New Orleans and it is, at one level, a love letter to the city of her birth. It is also a great deal more. "God, for the gladness here where the sun is shining at evening on/the weeds at the river,/Our prayers of thanks. /For the break of the game and the first play/and the last,/Our prayer of thanks." And so we suspect, as we read this epigraph, the kind of writer we are about to encounter. Mary Arno chose, from all Mary Arno's Thanksgiving is set against the backdrop of the city of New Orleans and it is, at one level, a love letter to the city of her birth. It is also a great deal more. Mary Arno chose, from all the poems she had read, this fragment from Carl Sandburg's "Prayers of Thanks." Mary Arno chose this poem that prepares us for her awareness of both the sunshine and the weeds, of the first play of the game, and the last. Mary Arno chose a few lines of a short poem that reveal a novelist whose vision is whole. "Arkansas was the last street for as far as you could see in the newest, barest western end of Kenner, Louisiana." I first became aware of Mary Arno's novel because I spotted the cover on Koehler Books' website. I am always intrigued by a puzzle, and this book cover made me stop, look closely, and then try to figure out what each piece might be. I'm still not sure I got them all. It was a good while before I went back for another look and discovered the locale and read a synopsis of the book and some background on the author. A while later, I stumbled on Arno's "Thanksgiving" Board on Pinterest. Oh, the wonderful photographs of New Orleans, each paired with a short passage from the book. And so, reminded of a wonderful city, discovering these small teasers of a novel well-written, I approached Mary to find out if she would submit the book for my review. It is the storyteller, after all, who decides what parts of the story are important, which characters are likable, which details must be included, and where the story ends. And when there are four? The reader had better, as I've said, be paying very close attention. The reader of Thanksgiving had best be paying very very close attention. Mary Arno's Thanksgiving is a fine piece of writing that employs many of the tried-and-true devices of good literature and employs them with skill. It juggles narrators with a particular deftness of hand, and is a wonderful evocation of a specific time and place. Mary Arno's Thanksgiving is, above all else-and for this reviewer, the thing that defines it--a piece of writing from the heart and rich with the tradition of the best American literature. Thanks, Mary Arno, for sharing your history, your sense of place, your writing skills, and a piece of your heart with all of us. Thanksgiving is a short but compelling read about the lives of three women growing up in the New Orleans area. In a fairly short book Arno says a lot about women, friendships, and relationships. A lot of the male characters come off pretty badly, but not all of them, which I appreciated. And the women aren’t perfect either. There is a story line about a sexual harassment lawsuit that I found really interesting and would have liked more of. This book has a very "local" feel to it, which is not sur Thanksgiving is a short but compelling read about the lives of three women growing up in the New Orleans area. In a fairly short book Arno says a lot about women, friendships, and relationships. A lot of the male characters come off pretty badly, but not all of them, which I appreciated. And the women aren’t perfect either. There is a story line about a sexual harassment lawsuit that I found really interesting and would have liked more of. This book has a very "local" feel to it, which is not surprising since Arno was born in New Orleans and worked as a journalist there. Arno's writing style keeps you engaged and moves the story along quickly, so you won't want to put it down. Arno’s writing, particularly about Emmaline who is being molested by her stepfather, is both spare but tragic. My issues with the book were the frequent narrator changes, and in this short book I didn’t get to know any of these women as much as I wanted to. The time spent on Harry may be important to the plot but I felt it took away from the rest of the book. I felt it would have been better if Arno had spent more time on the three friends and developed Peg a little more. I also thought Arno leaned a little bit too much towards the dramatic in the way she ended the book. She gives a fairly nuanced portrayal of these women’s lives up until the end. Note: I received a complimentary copy of this book from publisher Koehler Books. My full review is at http://thebookstop.wordpress.com. I received an advance copy of this book via NetGalley. I very much enjoyed this beautifully written book although there are some heartbreaking and even shocking moments. The book is set in Louisiana and begins in 1965 when the three principal characters are still girls, all from different backgrounds. We then get glimpses of them at various stages in their lives until an unexpected and shocking event decades later. Mary R Arno cleverly shows how their lives and the lives of those around them all c I received an advance copy of this book via NetGalley. Mary R Arno cleverly shows how their lives and the lives of those around them all come to interconnect over the years and how the lies and deceits of the past lead to a shocking end. The main events in the story all take place around the Thanksgiving holidays. I liked the (slightly) unusual device where the story is told in a third person narrative but then it changes to a first person voice so that we get the particular character's thoughts on the situation in more detail. I found it easy to imagine the characters and locations and the believable dialogue flowed smoothly - a really well written book. I wish I could somehow give this book a split rating. The writing was excellent and the storyline engaging, but the progress of the book felt disjointed. I wasn't sure if 2 days, 2 weeks, or 2 years had passed between events and I never felt the final coalescence of all the storylines at the end. Admittedly I don't like books that finish themselves in a nice neat package, but this felt like it ended mid-thought. It is sad that these issues overshadowed the characters and their story for me becau I wish I could somehow give this book a split rating. The writing was excellent and the storyline engaging, but the progress of the book felt disjointed. I wasn't sure if 2 days, 2 weeks, or 2 years had passed between events and I never felt the final coalescence of all the storylines at the end. Admittedly I don't like books that finish themselves in a nice neat package, but this felt like it ended mid-thought. It is sad that these issues overshadowed the characters and their story for me because I truly liked Emmaline, Peg/Maggie, and Mimi. I always look forward to reading books by local authors because they often leave me with a sense of familiar nostalgia, and “Thanksgiving” did not disappoint. The story begins during the characters’ formative years in 1965 New Orleans. We get a small glimpse into each of their lives, not knowing that the stories will later circle back to important events that happened during this time. 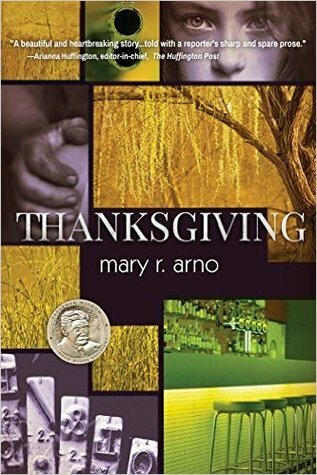 Mary R. Arno's "Thanksgiving" is a beautifully fractured narrative offering glimpses into the lives of three women over the course of their childhoods and adult lives. The writing style takes a bit of getting used to; I initially found it disjointed and hard to follow. Ultimately, however, I came to be very attached to the characters and their intertwined stories. Arno writes with a poetic, visual touch, bringing characters, story and setting to life through revealing and well-chosen detail. I won this book in a recent Goodread First Reads Giveaway. This was an enjoyable short read, which was well written. I can recommend this book if you enjoy short novels and I hope to read more books by this author. Among other cultural treats, New Orleans is known for it’s soul-searching blues and palate-pleasing cuisine. Mary Arno expertly offers up her own literary version of heart-wrenching blues and delicious descriptions in her novel Thanksgiving. The story is sad yet satisfying, involving four adolescent acquaintances who harbor deep emotional secrets well into adulthood. Arno is a skilled writer whose economy of words makes the book enjoyable to read and easy to digest. Just as impressive, the author Among other cultural treats, New Orleans is known for it’s soul-searching blues and palate-pleasing cuisine. Mary Arno expertly offers up her own literary version of heart-wrenching blues and delicious descriptions in her novel Thanksgiving. THANKSGIVING ,by Arno, takes place during a time i can thoroughly relate to and about which i enjoy reading. The 60's of course.....to the present. Summertine - the "facts of life" theories, Trixie Belden instead of Nancy Drew for me, and using our wits and imagination. A slender book that i did not want to put down...actually i did not instead I stayed up late to finish. Well written. My only wish is that the book was better fleshed out, THAT would have made it excellent! MARY R. ARNO is an award-winning author and journalist who has worked at newspapers across the southern United States, from Los Angeles to New Orleans to Orlando, with a couple of others in between. As a reporter and editor, she covered everything from murders and refinery explosions on the police beat to small-town politics to national political conventions and campaigns. At the Los Angeles Times MARY R. ARNO is an award-winning author and journalist who has worked at newspapers across the southern United States, from Los Angeles to New Orleans to Orlando, with a couple of others in between. As a reporter and editor, she covered everything from murders and refinery explosions on the police beat to small-town politics to national political conventions and campaigns. At the Los Angeles Times, she was part of teams awarded Pulitzer Prizes for covering the L.A. riots in 1992 and the Northridge earthquake in 1994.